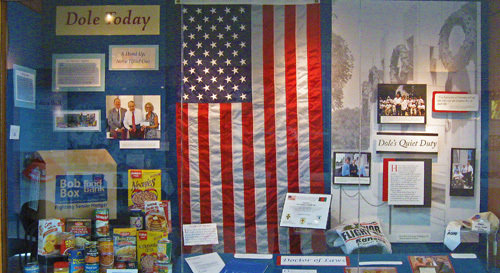 The "Dole Today" exhibit was a regularly updated exhibit running from 2009 through 2013, focusing on Senator Dole as an active private citizen. 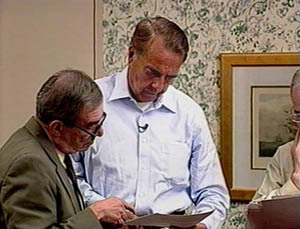 The exhibits featured projects and honors bestowed on Senator Bob Dole. Highlights included greeting World War II veterans upon their arrival at the National World War II Memorial in Washington, DC, his work with the Bipartisan Policy Center, and his induction into the Kansas Walk of Honor. From May 5th through August 21st the Dole Institute of Politics hosted the Herb Block Exhibition. 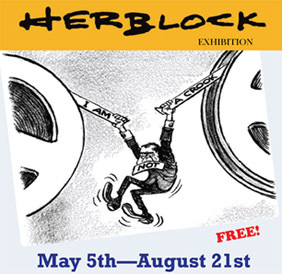 The exhibit features political cartoons on the environment, education, civil rights, democracy, and thirteen U.S. presidents by four-time Pulitzer Prize winner cartoonist Herb Block. For more information about the exhibition visit the Herb Block Foundation. Dr. Herron is an Associate Professor in Political Science at KU and the former director of the Center for Russian, East European, and Eurasian Studies. He has traveled extensively in Eastern Europe and Eurasia, including a semester as a Fulbright scholar in Ukraine and nine election observation missions in Azerbaijan, Georgia, Moldova, Russia, and Ukraine. 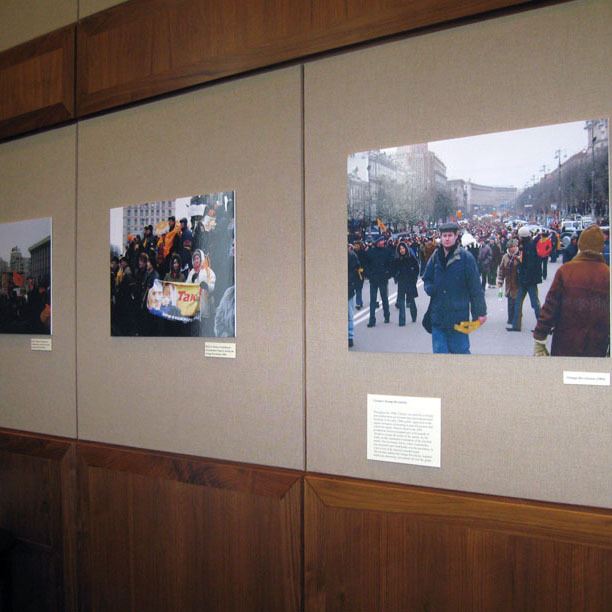 His photos and objects documenting election activities in former Soviet states were displayed in conjunction with programs at the Dole Institute during Fall 2011. 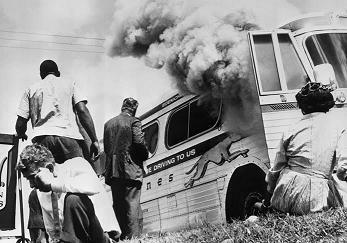 The traveling exhibit, "Freedom Riders" described the saga of the Freedom Rides of the summer of 1961. More than 400 Americans traveled together through the Deep South in small interracial groups on buses and trains to challenge the mores of a racially segregated society. The exhibit was created by the Gilder Lehrman Institute of American History in partnership with WGBH Boston/The American Experience. More information is available here. 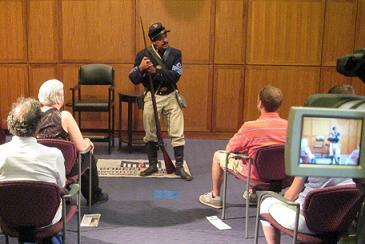 A documentary film series was featured in conjunction with the Freedom Riders exhibit including the PBS American Experience film, "Freedom Riders" and the latest documentary by Kevin Willmott, "From Separate to Equal." The exhibition presented personal letters, documents, cartoons, photographs and broadsides from the Gilder Lehrman Collection previously unavailable to the public nationally. A captivating photography exhibit on the role of women serving in the U.S. Senate was displayed in the summer of 2010 at the Dole Institute of Politics at the University of Kansas. The 38-photograph collection, titled “Changing the Face of Power: Women in the U.S. Senate,” documents the unprecedented role of women in the Senate, both behind-the-scenes and before the microphones. Photojournalist Melina Mara began the project in 2001, photographing the 13 women in the U.S. Senate. She continued through 2003, as their number grew to 14. Article from the Lawrence Journal-World on exhibit opening. This original 34-star, Kansas Statehood, Civil War era flag, circa 1861-1963 was on display in the Reading Room of the Dole Institute through the month of February. The flag was on loan from KU Professor Emeritus Dennis Dailey. The flag was known as the "Lincoln Flag" in part because Abraham Lincoln was the only president throughout the period it was used as the national flag, and because Lincoln would not allow any stars to be removed from the flag even though seven southern states were preparing to secede from the Union. The flag was made of cotton muslin and is 11 feet long and 8 feet wide. The flag was machine stitched and is in good condition. The stitching is very tight, with fading consistent with age. The stars on the blue canton are in the “Staggered Star” pattern and are generally bright and fully intact, showing on both sides of the flag. In the early 1970’s, the ends of the flag were professionally restored at the Valley Forge Flag Company in Valley Forge, Pennsylvania. On August 21, 2004 the flag was authenticated and appraised at the PBS Antiques Road Show in Portland, Oregon. The flag was likely flown at a military installation or on a large public building. Visitors to the Dole Institute can learn how presidential candidates prepare for the high stakes game of televised debates. This exhibit features never-before-seen photographs of Senator Dole and his advisors preparing to debate against President Clinton. Also on display is the mock podium that Senator Dole used to practice for the debate. Made out of foam core board, it was built to exactly the same dimensions as the podium used in the official debate. 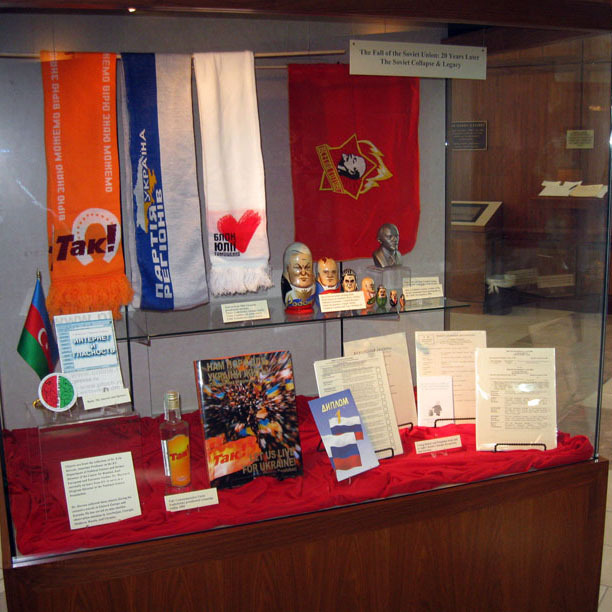 In addition to the permanent exhibits in the Dole Institute's Hanson Hall, new temporary exhibits are regularly added. "Leader of The Pack: Life as a Senate Leader"
"Leader of the Pack: Life as a Senate Leader" is an anthropological exploration of sorts, displaying photographs and objects, some of which were removed from the Senator's desk upon his retirement in 1996. Dole's commitment to fair leadership and his dedication to public service are emphasized. The exhibit also includes his daily schedules book, never before viewed by the general public. The exhibit was designed and mounted by two of the Institute's summer archival interns, both graduate students at the University of Kansas.